Just to get everyone up to speed, let's cover the basics first. 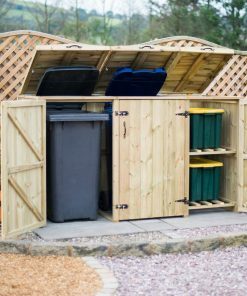 A wheelie bin cover is generally a wooden box with a lid and a door at the front. They're used to hide those ugly wheelie bins away, meaning that your property maintains its kerbside appeal. This means that they can be a great investment, but that's true only if you're purchasing something that is going to last. The big problem here is that these covers are usually made from wood. Wood has both good and bad points as a construction material. It's great because it looks natural and fits well in a garden, plus it's generally easy to work with and fairly cheap to buy. But wood doesn't always respond well to the elements, and in a climate like ours, that's a definite issue. Not all kinds of wood are suitable for outdoor use, and that's why you need to look at quality building materials. What Happens With Low Quality Wood? Let's say you buy yourself a nice bin cover, but you don't check out wood quality. Maybe like many of us you're on a budget and so go for the more economical option. Sure, that saves you money in the short run, but in the long run it won't. Why? Because that storage box just won't last. Buying a cover made from low quality or untreated wood is going to result in decay over time. As the wood gets wet, frozen, and then heated up again it will split and begin to rot, leaving you with what basically amounts to a rather smelly pile of junk in your garden. Not at all what you were looking for. Even worse, some building materials are so bad that they're impossible to work with in the first place. Many covers are flat pack, meaning you'll need to self assemble. Cheap wood splits when screws are inserted, and softer woods are going to make a flimsy structure. That makes them unsafe, and may mean that you need to spend even more money purchasing extra wood to brace the structure. Again, probably not what you were looking for. Type of Wood: first, look at the type of wood the cover is made from. Hard woods like teak, for example, are long lasting, though they do tend to be more expensive. Soft woods can be an option, but you're looking at the harder end of the soft wood scale, so something like Scandinavian redwood is ideal. Other variants of pine are also suitable, but you'll need to ensure that the wood has been treated, which we'll talk about below. Treated Wood: never, ever buy a cover that is made from untreated wood. There are two kinds of treatment and either or both will work. Pressurised wood is stronger and more weatherproof than untreated wood, and this is your first option. Your second option is wood that has had a stain or treatment applied to it already. These treatments should help make the wood weatherproof, but will almost certainly require a little maintenance, but then, so will pressurised wood (and we'll get to maintenance soon!). Untreated wood simply won't last in the UK climate, since it will begin to rot as soon as it gets wet. Sustainable Wood: your last concern is whether or not the wood used comes from sustainable resources. The environment is important, of course, so do check to make sure that the wood used is FSC source timber, meaning that it's environmentally friendly. Buy top quality and you should get something that lasts you for years, but you will need to think about a little maintenance as well. Ideally, your cover should be treated or stained once a year or so, and either late spring or early autumn is the best time to do this. Do you HAVE to do this? No, you don't, but if you've invested in something of higher quality at greater expense then this maintenance will make sure that your cover lasts longer and stays looking good as well. Wheelie bins are everywhere these days, and that means that there are plenty of different cover options around too. But not all covers are created equal. A cheap product made from low quality wood is just going to be a waste of money. It's definitely worth your while to spend a tad more to get something that's going to last you an awful lot longer. 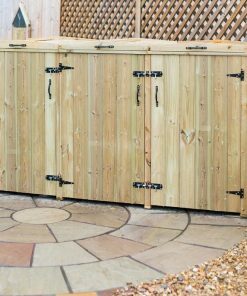 A wheelie bin cover can be an attractive addition to your property, but don't waste your cash, opt for something of great quality that will stand in your garden for years to come!